Shed for machine setup Length 50 ft. x Width 30 ft. x Height 15 ft.
We are backed by advanced designing techniques and a dexterous team of professionals; we are able to offer our customers a wide array of Semi Automatic Fly Ash Bricks Machine.These products are fabricated using high-grade quality raw material and advent technology that is procured from trusted vendors of the market. Further, these products are manufactured in adherence with international quality standards and are tested on various parameters, before final delivery to our customer's end. Piston is Hard ChromeWiper on top of the CylinderSuper Vibration & Pressing system for maximum compaction & strengthDischarge of finished product though converge belt for faster productionAutomatic Pressing & Demodulating by preset auto-timer controlFly Ash Bricks will have shining smooth finishIndicative only production depends upon the labour efficiency & mix qualityHigher Tonnages, brick size as per customer specification standers brick-size is 230 x 100 x 75mmSpecifications are Subject to change for Improvement, Specification, Weight, Volume are approximate onlyMfg may be introduced such alterations as they may deem fit without previous notice, the machine can supply as per customer's specific requirements, machine capacity mentioned is only for guidance, it will vary with materials. Production Capacity 5/000nos. to 5/500nos. Welcome to Bharat Hydraulic where you can find ingenious sharp vision global network and powerful backbone. The Company carries the vision to cater excellent machinery in construction business. We believe in producing superior quality machinery with sharp vision on market. It takes lot of skills to design product in competitive market. We provide innovative and Sustainable Hydraulic & Vibrating Technologies for Construction Machinery. We “Bharat Hydraulic” are Manufacturers of Multi Purpose Plant, Automatic 2 in 1 Plant, Bricks making Plant, Interlocking Paver Block Plant, Mixer Machine, and Material Handling Machine. 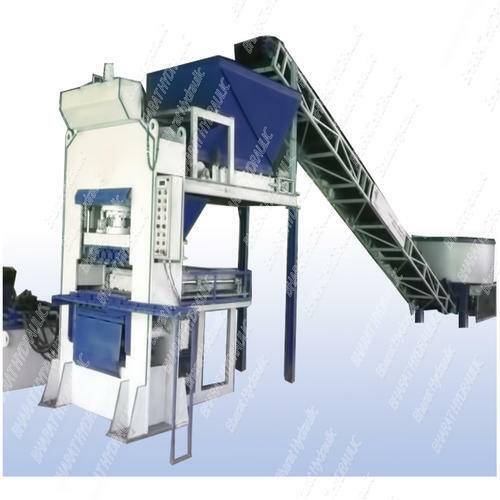 Fully Automatic Machine, Semi Automatic Machine & Manual machine of Hydraulic System & Vibrating System Machine for Fly Ash / Cement Bricks, Interlocking Colour Paver Block, Solid Block, Kerb Stone & Chequered Tiles Making Plant. Quality is the cornerstone of “BHARAT HYDRAULIC” success. We’ve worked hard to establish a reputation for quality and also, we are trying our best to be one of the world’s leading construction machinery manufacturing companies. The quality of our work is vital to our mission of bringing better Machinery work to Our Client around the World. We are committed to maintaining, supporting, checking and improving our quality systems to exceed the quality standards demanded by our clients and regulatory authorities. “The company follows a customer-centric approach and believes in 'growth through the growth of customers'. Only a satisfied customer makes us gratified. We wish to create a long-term business relation with our prospective clients”. We are assisted by a team of proficient professionals in all the stages of our business process. These experts working with us, utilize their in-depth knowledge of the industry for completing assigned tasks with perfection and ease. All our experts utilize the available resources with the aim to make the offered product range, minimal and cost-effective. In order to maintain healthy working atmosphere within the firm, all our professionals work in close coordination with one another. Further, we periodically arrange training sessions and seminars to keep our workforce abreast with latest technological advancements and changing market dynamics. Our organizations main aim has been into achieving the customer satisfaction to the fullest. Although accolades and achievements have always been a part and parcel of our job, the only reward has been in enduring greater levels of customer satisfaction. To achieve the same, we are ensure manufacturing of a defect free range.